The Eve V is a beautiful 2-in-1 with a vibrant display, but it doesn’t perform as well or last as long as competitors. The Eve V (pronounced “vee” not “five,” selling for $799 to start, $1,599) is an unlikely story. This 12.3-inch, detachable 2-in-1started its life on Helsinki-based tech company Eve-Tech’s forums, where a community of users argued and collaborated over the specs they wanted. The concept found its way to Indiegogo, where it was funded, and now, it’s shipping. So how did it turn out? Too many cooks can spoil the broth, but the Eve V is a solid first attempt. The community’s decision to go with a weak Intel Y-series CPU is questionable, and the battery life isn’t great. But a stunning design and one of the best displays I’ve seen this year make this machine worthy of consideration, as long as you trust an unproven company. The Eve V is built like a champ, and if you told me any massive, established laptop vendors had produced it, I would believe you. There’s one exception: There’s very little branding, which I appreciate. The black, aluminum tablet has very little flourish on the back, except for a small, almost unnoticeable upside-down triangle (the Eve V logo) at the very bottom. The kickstand pulls out from the side like what happens on a Microsoft Surface Pro, and it’s the only part that feels a little flimsy. Though I had no issue with it standing on my desk, it felt cheap, and I found myself wishing it were a little thicker. Under the Kickstand, there’s a fun pattern of Eve V and Eve-Tech logos, which adds a bit of surprise whimsy that I appreciated. The keyboard cover is a great imitation of the Surface’s, made with Alcantara fabric and providing a connection to the tablet via pogo pins. The keyboard has some of its own whimsical surprises: The backspace button is labeled “oops!” which I think is kind of silly but gave several of my colleagues a good laugh. (One of them called it “a-dork-able.”) The V key is marked with the Eve-V logo, and pressing Function+V unearths what I think is the machine’s coolest secret: multicolored backlighting. You can switch among seven colors, including purple, red, blue, green and cyan. A very thick bezel surrounds the 12.3-inch, 2880 x 1800 display, but there are no logos on the front like you would see on a 2-in-1from a major vendor. In fact, there’s not even an Intel sticker on this thing. At 3 pounds with the keyboard cover (2 pounds on its own) and 11.6 x 8 x 0.3 inches, the Eve V is both a little larger and thicker than competitors, which Eve-Tech tells me is a trade-off for battery life. The Surface Pro is 2.4 pounds with its Type Cover (1.7 without) and 11.5 x 7.9 x 0.3 inches, while the Lenovo Miix 720 is 2.6 pounds with its keyboard (1.7 pounds on its own) and 11.6 x 8 x 0.6 inches. The Eve V’s set of ports is the best among the 2-in-1’s competitors. On the left side, you’ll find a headphone jack, USB Type-C port, Thunderbolt 3 portand USB 3.0 port. On the right, there’s another USB 3.0 port and a fingerprint reader. The microSD card slot is hidden behind the kickstand. Microsoft has only now introduced USB Type-C on its Surface Book 2, and you still can’t find it, not to mention Thunderbolt 3, on the Surface Pro. The Miix 720 has only one Type-C port. The 12.3-inch, 2880 x 1800 display on the Eve V was built to impress. The company said that every single unit is individually calibrated, and, honestly, I believe it. When I watched a 1080p trailer for I, Tonya, actress Margot Robbie’s blue leotard practically glowed against the background of an icy, white skating rink, and I could see every shaving against the edge of her skates’ blades. The Eve V’s screen covers an excellent 129 percent of the sRGB color gamut, passing the average 102 percent and just shy of what you get from the Miix (130 percent) and Surface Pro (140 percent). It’s the brightest of the field by far, at an average of 442 nits. The average is just 288 nits, and the Miix (361 nits) and Surface Pro (396 nits) were dimmer than the Eve V.
The keyboard on the Eve V may look pretty with its multiple backlight color options, but typing on this keyboard takes a little bit of adjustment. It has 1.3 millimeters of travel, just like the Surface Pro. The keyboard cover doesn’t have a ton of flex, and the Alcantara fabric is comfortable on the wrists. The 78 grams of actuation make the Eve V particularly punchy, and it took me a while to get comfortable with it. On the 10fastfingers.com typing test, I reached 107 words per minute, which is my usual result, but my initial typing tests had me at a 4 percent error rate, twice my average. The 3.5 x 2.4-inch touchpad uses Windows Precision drivers, which means that it instantly responded to even the most complex gestures. That includes showing all of my open apps with a three-finger swipe up or tapping four fingers to see my notifications in the Action Center. The stylus has 1,024 levels of pressure sensitivity, which is good, but not as precise as some others on the market. It feels nice and smooth on the screen, but I wish it had an eraser like the Surface Pro’s stylus. It also sticks magnetically to the right side of the tablet for storage, but not the left, like the more ambidextrous Surface pen. Connecting the stylus covers up the USB 3.0 port on the right, and I didn’t find the magnets to be secure. I felt better carrying it around in my pocket. The speakers on the top of the tablet produce balanced audio. I just wish it were a smidge louder. When I listened to Bebe Rexha and Florida Georgia Line’s “Meant to Be,” the vocals, rhythmic handclaps and twangy guitar were all clear, but it only just filled a midsize conference room. I certainly wouldn’t mind something that boomed a little more. Eve-Tech and its community opted for Intel’s Y-series CPUs, which it says allow for cooler systems and better battery life. The trade-off, though, is performance. The model we reviewed came with an Intel Core i7-7Y75 CPU, 16GB of RAM and 512GB of storage. In our testing, Y-series CPUs have worse performance both on benchmarks and in real life, and it showed in the Eve V. With 30 tabs open in Google Chrome, including one streaming 1080p video from YouTube, there was occasional, split-second lag while switching between tabs. It didn’t affect usage a ton, but it was noticeable. On the Geekbench 4 overall performance test, the Eve V notched a score of 7,109, falling short of the ultraportable average (7,557), as well as scores from the Surface Pro (8,652, Core i7-7660U) and Miix 720 (8,434, Core i7-7500U). The Eve V took 18 seconds to transfer 4.97GB of files, for a rate of 282.7MBps, which is faster than both the average (228.9MBps) and Miix’s showing (203.6MBps). 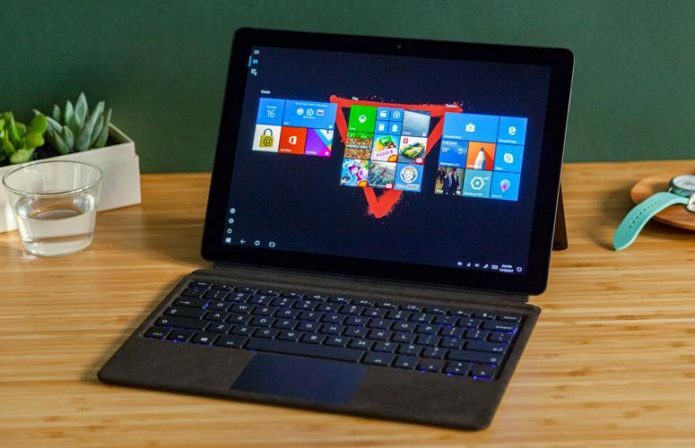 Eve-Tech’s machine is not as speedy as the Surface Pro, though, with its score of 339MBps. It took 4 minutes and 19 seconds for the Eve V to pair 20,000 names and numbers in our OpenOffice spreadsheet macro, and while that’s faster than average (5:43), the Miix 720 (3:34) and Surface Pro (3:13) were both swifter, the latter by more than a minute. With Intel HD 615 integrated graphics, the device isn’t meant for graphics-intensive tasks, like photo editing or gaming (though you could attach an eGPU to the Thunderbolt 3 port for that). The Eve V scored 50,633 on 3DMark Ice Storm Unlimited, less than the average (58,877) and the Surface Pro’s mark (109,678, Intel Iris Plus 640), but higher than the Miix’s showing (49,088, Intel HD Graphics 620). Eve-Tech claims that the Eve V’s sacrifices, a Y-series CPU and a bit of extra heft, are all in service of long-lasting battery life. But in our testing, that wasn’t the case. The 2-in-1 lasted just 6 hours and 59 minutes on the Laptop Mag Battery Test, which continuously browses the web over Wi-Fi at a fixed brightness. That result is better than the Miix 720’s time of 5:40, but less than the ultraportable average of 8:22 and the Surface Pro’s 7:30, which was half an hour longer. The 1600 x 900, front-facing camera on the Eve V is squarely average. While it’s sharp and it caught every hair in my beard, it had trouble with colors. When I took a photo at my desk, my blue sweater appeared gray, and the lights behind me were entirely blown out. The 2560 x 1440 rear shooter is better. I went up to our roof and took a picture of a water tower and surrounding buildings, and could make out all of the wood paneling on the tower and the bright blue late-morning sky above it. Some buildings in the back fell out of focus, but in a faux-bokeh effect that I kind of dig. Don’t worry about hand sweat: The Eve V will stay nice and cool whether you use it as a laptop or a tablet. After the machine streamed 15 minutes of HD video from YouTube, the back of the slate measured just 86 degrees Fahrenheit, which is lower than our 95-degree comfort threshold. The Eve V matches Microsoft’s offering in that it includes no extra bloatware. The only junk you’ll have to deal with is what comes preinstalled with every copy of Windows 10, including Keeper, Candy Crush Soda Saga, Drawboard PDF, Minecraft: Windows 10 Edition, Bubble Witch 3 Saga and March of Empires: War of Lords. Those who already bought an Eve V through its initial Indiegogo campaign get a 2-year warranty. Eve-Tech will be offering a one-year warranty to those who buy directly. The company told Laptop Mag that it will replace units it can’t fix remotely, and then repair and refurbish broken units for later warranty exchanges. The Eve V that I reviewed cost $1,599 and came with an Intel Core i7-7Y75 CPU, 16GB of RAM and a 512GB PCIe SSD. To bump up to 1TB of storage with the same CPU and RAM will cost you $1,999. The base model runs for $799 with an Intel Core m3-7Y30, 8GB of RAM and a 128GB PCIe SSD. And the $1,199 model comes with an Intel Core i5-7Y54 CPU, 8GB of RAM and 256GB of storage, or you can increase it to 16GB and 512GB for $1,599. These specs closely (but don’t exactly) mirror those of Microsoft’s Surface Pro, except that Microsoft’s lower-end models come with 4GB of RAM and the higher-end models come with better Iris Plus graphics. None of Microsoft’s offerings include a stylus ($99.99) or a keyboard cover ($129.99), while the Eve V comes with both. The Eve V, is, largely, a success story. It’s a crowdsourced, crowdfunded machine that somehow made it off the internet and into my hands, and it works. The display is bright, vivid and gorgeous, and I’m a fan of the industrial design. It certainly doesn’t feel like a first go-around. Of course, the Y-series CPU isn’t as powerful as others (there’s a reason you rarely see them in notebooks or tablets), and I’d trade a fanless design for more power. The battery life is also on the short side, so you’ll want to take an adapter with you. Your best alternative to the Eve V is Microsoft’s own Surface Pro (also starting at $799, and hitting similar price points), and while you’ll get stronger performance and slightly better battery life with the Microsoft machine, you’ll have to pay another $230 for the stylus and keyboard. The Eve V comes with those things. But Microsoft is also established — you know they’ll be there in six months for support. Do too many cooks spoil the broth? That’s the saying, but in the Eve V’s case, though the meal isn’t perfect, it’s entirely edible.